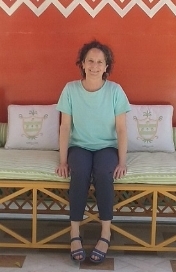 Liz Gamberg’s work is informed by various influences: her mathematics background, her meditation and yoga practice, what she reads, and patterns and geometry drawn from daily life. As an interdisciplinary artist I continue to discover new mediums for my designs as well as fresh contexts for my evolving images. Because I’m drawn to designing and building pieces people use in their daily lives, I’ve created hand-built ceramics and collage for decades. Rug design is also an essential aspect of my life as an artist. My rugs are hand-knotted and made of handspun, hand-dyed wool woven in Nepal. More recently, I’ve begun to work with fabric, needle and thread, and on my sewing machine. I love to combine unexpected patterns and color. 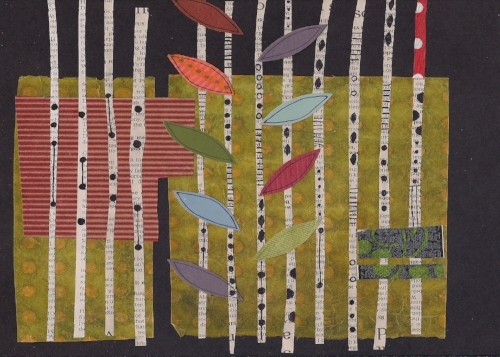 The resulting collages are largely created from repurposed fabric and paper I’ve collected over many years: including gift wrap, envelopes, paper napkins, bags, candy wrappers, and yardage from thrift stores.